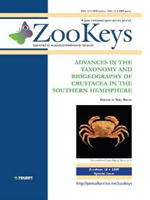 This is the first issue of ZooKeys devoted to taxonomy of the Crustacea, specifically crustaceans from the Southern Hemisphere, with contributions describing new taxa from Australia, New Caledonia, the Tasman Sea, Fiji, Madagascar and Antarctica. The issue comprises six papers on the Peracarida, and one each on Decapoda and Spinicaudata, describing four new genera, 12 new species, and new diagnoses to a further four genera. The first occurrence of the Eurasian clam shrimp Eoleptestheria ticinensis in Australia, is reported. There are three isopod contributions, two describing new species and new genera of deep-water Serolidae from Australia and the tropical southwestern Pacific, the third describing a new genus and new species of Anthuroidea from Australian coral reefs. One paper revises the amphipod genus Epimeria describing two species, one new, from Antarctic waters of the Ross and Weddell Seas. Two contributions on the Tanaidacea, describe new species from tropical Australia. The remaining paper describes a new species of freshwater crab (Family Potamonautidae) from Madagascar.